BQ: We’ll talk about Canberra too in a minute, but what’s coming up in the mid-term future? JP: We start to get into festival season from January onwards. We do a lot of festivals. 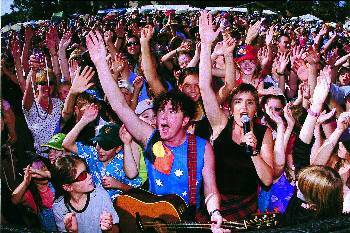 We’re still waiting to hear if we’re at the National Festival in Canberra — we’d love to go back; haven’t been for a few years. And then back to Europe next July/August, and then we head to America for the Americana festival. A lot of acts have just been there; Dobe Newton was the head guy that brought them over, but Kasey Chambers and Shane Nicholson and a few others have been over there. So we’ll go see how that works next year. BQ: Do you find there’s a bit of an appetite over there for Australian music? JP: In Europe? Well, yeah, the big one we just did in Denmark [Skagen] had Shane Howard there. And Totally Gourdgeous have been there, Claymore, Eric Bogle — so lots of Australian acts do go well over there. BQ: I was talking with someone recently who said that one or two acts might go to a festival or an area, and they start to carve out a bit of a path for those that come behind. Do you find that you’re benefiting from others’ experiences? JP: I think we got into the Danish festival because some other Australian band recommended us. So I think that was the case. Because the guy just phoned up, and I was just out with my daughter playing in the swing park, and this guy rings up and says, “Hi, I am Pyr, I am the postman from Denmark”. And I thought, Oh, who’s this? And he said, “We want you to perform at my festival”, and I put the phone down — I thought he was some nutter! JP: And then he phoned or emailed back next time, and he IS the local postman but he’s also the festival director! And he said that somebody recommended us, and then we’ve recommended other Australian bands. And then the French (Mirande) festival we did the year before, we knew somebody in Capital News, it’s like a country music magazine, and they introduced us to Dream West magazine in France. And due to that association with Capital News, that led to a few Australian bands playing in France. Jetty Road was one of them, and a few others. We just find that the Scandanavian countries are into the folk/roots music thing that we’re doing. We met Donovan over there; he lives in Ireland but spends a lot of his time over in Denmark and Sweden. BQ: Let’s talk about this weekend; you’re playing at a seniors’ festival! JP: Senors? And senoritas; they’re allowed to come as well! We’ve got a really good advocate in Canberra, a guy called Lindsay Burge. He got us into the Multicultural Festival. And he’s got us into this festival on Sunday, but it’s for the whole family as well. There’s going to be lots of rides and things for the kids as well. It’ll be fun; by the lake [Tuggeranong]. BQ: I just have fears because knowing how energetic your shows are, I just have visions of octogenarians trying to keep up with you and your dance styles. JP: Is that people with eight arms? JP: We actually do a lot of retirement homes as well during the week and we love doing them. We were doing old war songs and then we realised that people in their 70s were 14 or 16 when Elvis was around so they’re actually into rock and roll rather than Al Jolson! So we’ve always thought they’ve wanted to jump about a bit. BQ: Have fun with that! And then Sunday evening in Canberra, you’re at King O’Malley’s — you’ve played there before, haven’t you? JP: Well, I thought it was six o’clock, but it’s actually about three thirty, so we’ll dash from wherever we’ll be; Tuggerrrrrarong? Tunganwrong? BQ: Tuggeranong [pronounced ‘Tug-ra-nong’ — in one syllable if you can manage it]. JP: And it’s a free concert, so everybody’s welcome. It should be good; I really like the place. The owner is a really lovely guy, and we met his whole family there in February when we played, and they couldn’t be any nicer. It’s a nice pub on a Sundee, I think! So, I’m looking forward to coming to Canberra.